What are the best Forex Trading Tips and Tricks? Find them all out here and now! In a perfect world, all you would have to do to become a professional trader would be to pick up a few trading books and courses and study for a little while. This is the way that most professions are pursued. A doctor goes to medical school. A dentist goes to dental school. Even hairdressers and auto-mechanics go to schools as well that teach them all that they need to know to become professionals. Unfortunately, this is not the case with Forex trading. There are no public schools or universities that teach people to trade at a professional level. The most that we have are books, Forex trading tips or courses on the internet that were developed by people who have traded successfully for a number of years. Some of them even open up academies that provide certificates when you complete their courses. The problem is, unlike studying to be a doctor, or a scientist, or even a musician, there are no set rules to trading. There are hundreds of different ways that people can trade. There is day trading, intraday trading, swing trading, price action trading, and others. Plus, in addition to these, there are hundreds of indicators and charts that traders have to choose from. As you can imagine, this makes things very confusing and difficult for new traders who do not know where to start. They think that they have to learn everything about trading in order to be successful. Some of them think that there is one specific way of trading or specific Forex trading advice and if they find it and learn it, it will make them ultimate traders! They are completely wrong. Worst of all, they are focusing on the wrong things. The way that a trader goes about trading is different from person to person. Every trader works differently and recommends different ways of making a trade. The successful ones though, follow a set of very simple rules/guidelines that allow them to make profits consistently. Any successful Forex trader will give you one answer to the question “how to trade Forex successfully for beginners?” – keeping track of the support and resistance levels on his charts is one of the important steps to planning the entry and exit for a trade. Knowing where each level is, is essential to knowing how to buy low, and sell high. 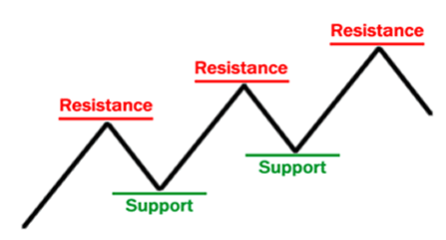 So what is support and resistance? Support describes the level where the price cannot break below. It acts like a floor, that price bounces off of, and goes up. Resistance is the area where price does not break above. It acts like a ceiling where price bounces off and goes down. Essentially, what a good trader aims to do, is to buy at the Support level and sell and the Resistance level. So, how does a new trader find the support and resistance? He can do this by simply looking at the past price movements on the chart and marking the areas that look similar to the picture above. One of the most important Forex tips and tricks, if not the most important that new traders often ignore when trading is the risk/reward ratio. A professional trader never forgets this. A professional trader understands that the key to being consistent in making profits is to make small losses and big wins. When choosing a trade, it is important to only pick the ones where your reward will be at least double the risk that you are taking. This is a 2:1 ratio. Many traders, especially professionals only take trades have at least a 3:1 ratio (where the reward has to be three times larger than the amount of money they are risking in the trade). If a trade opportunity does not meet this rule, they ignore it, and wait for a better one. Any professional trader will tell you that discipline is the only way to survive in the trading world. If a trader does not stick to his own rules, then he will never be a professional. If a trader is disciplined then he will be able to ignore emotions that can cause disaster in a trade. If a trader is ruled by his emotions then he will make bad trade decisions. He will be more likely to make bad trades, keep his losses for too long, and close out his winning positions too early. Discipline to the trading strategy will allow the trader to operate with a clear head, make the right decisions every time, and win Forex trading. Waiting for the right trades is also very important to trading correctly. Many new traders think that they have to trade everyday or they won’t be seen as true day traders. This is not true. In fact, although it may be hard to believe, successful day traders do not trade every day. If they do not see any trade opportunities that match up with their trade plan, they do not make any trades for that day. This gives them a better chance at making the right trades. Before you make any trade, you should know how you will exit the trade if it goes bad. One daily Forex advice that many new traders do not realize is that setting your stop loss is an essential part of the trade. The use of a stop loss helps to prevent you from losing more money than you are comfortable with. In the end it will save you from wiping out your account, and being one of the infamous 90% of Forex traders who fail. Setting your targets are just as important. Never enter a trade if you don’t know where you will exit it. Place your ‘take profits’ at areas where price reverses. Because price can change quickly, leaving your trading positions open is a big risk that professionals do not make. Fear is one of the biggest trade killers. It makes traders second guess their skills, and causes them not to take the trades that they should. It also make them ignore their own trading rules, and make bad decisions. Greed is also the other emotion that will surely make you lose. Greed allows traders to see opportunities that are not there. It makes them keep positions that they should close. It also causes them to make foolish decisions like over leverage, and over trade. If a trader gives in to these two emotions, then he will most definitely lose his money. It is great if a trader can spot a trade opportunity with a good risk reward ratio. What separates the amateurs from the professionals is that the professional only uses a certain risk percentage. This is a wise thing to do. If you talk to professionals, they will tell you that they only risk a small percentage of their account on each trade. Sometimes the number is 5% sometimes it is as small as only 1%. When they see a trade opportunity with a good risk/reward ratio, they calculate the lot size that they need to use. This makes it easy for them to always risk the same percentage on every trade that they make. This Forex trading secret seems obvious, but for many new traders, they think that they can make millions with Forex with the smallest microaccount. Forex trading is not magic. I’m not saying that it is not possible. But making large amounts of money with a small account will take time, years, if you are trading properly. Trading Forex can be difficult, but it is rewarding. It also requires large amounts of discipline. That being said, you should not trade with money that you cannot afford to lose. It will cause unnecessary stress and will make it easier for you to be affected by negative emotions like fear and greed. You will lose. Accept it. Not every trade that you make will be a winner. The market is not a living creature that has a rational mind. It will not always move in the way that you think. It is dynamic, ( it changes constantly) and a trader should be prepared to take losing trades. Professionals know that they will not win every trade. This is why they have stop losses in place to close their trades if this happens. The best thing to be as a trader, is to be prepared. That being said, as a new trader, it is important to review your trades in order to know if a losing trade was because of something that you did, or did not do. Keep a journal. Record your entries and exits, and the reason you entered each trade. Also record the trade result. It will help you to recognize areas where you need to improve to make your trading better. We may not live in a perfect world and there may not be any university courses that will teach us to be professional Forex traders. What we do have though, is the ability to follow healthy trading habits. With practice they will bring you one step closer to becoming successful.